Now her parents have suddenly taken an interest in everything she does, and their timing couldn’t be worse. Sasha’s father wants her to become BFFs with snooty Alyssa Turner, who hates Krystal for stealing her boyfriend. Then there’s Antoine Watson, the boy Sasha has liked forever, the boy her parents would never approve of. But with the dark side getting more dangerous by the day, and the Mystyx’s own powers growing in unexpected ways, Sasha is facing choices that could affect her friends, her love life—and even her destiny…"
What he really means is that want rarely comes into play where I’m concerned. My parents seem to have everything their chilly little hearts desire. Me, on the other hand, well, let’s just say I’m not like my parents. Some days I wake up and even consider requesting a DNA test. This is another YA series that I continue to enjoy. Artist Author has created a paranormal adventure featuring a teenage clique of supernaturals that keep me tagging along as they deal with their personal dramas and use their powers to deal with the Darkness that is stalking them. In the latest book, the story turns to Sasha. Her friends continue to judge her and think she’s a stuck up “Richie” simply because her parents are. I thought she was a likable character, a little bratty and spoiled at times, but overall she was more mature than her friends, Krystal and Jake. Jake and Krystal got on my nerves in this book. I always thought that Krystal was self centered, but she really out does herself in this book. And Jake has serious anger issues. His story is the next book, so hopefully I’ll be able to have a better understanding of who he is and what he’s dealing with personally before I start to hate him. A new member was introduced to the supernatural clique and she seems to balance out the trio which is a good thing because their friendship was seriously headed for an ugly break up. I am anxious to figure out the mystery of the “M” birthmarks and how all the kids ended up in the same town or exactly why they have their powers. The mysteries are slowly unfolding, giving me just enough bits of information to keep me following the story. 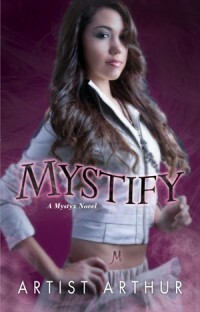 Overall I really liked Mystify and will continue reading the series. I am very interested to know what in the world is going on with the Darkness and what it’s really after. 4 flowers of love. Very good and a recommended read. Been meaning to start this. I still have the first book to read! It's a pretty good YA series. I usually don't read middle grade YA, but I heard about it through Twitter and now I'm hooked.